The protests that rocked Iran in December and early January largely fizzled out after the government arrested more than 3,000 people. We'll have to wait to find out if this was the beginning of an era of upheaval or a brief spasm of malcontent followed by a longer period of silent malaise. Either way, it should put to bed once and for all the myth that Iranian President Hassan Rouhani is some kind of reformer. 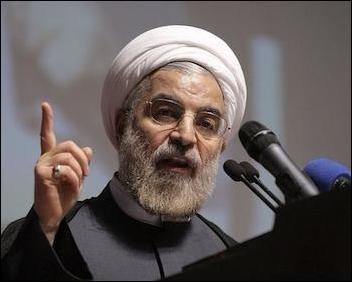 Rouhani famously ran as a so-called "moderate" during the farcical 2013 election where, as always in the Islamic Republic, only the hand-picked candidates of Supreme Leader Ayatollah Khamenei can get their names on the ballot. He was a moderate in a relative sense compared with his hard-line opponent and former Revolutionary Guard commander, Mohammad Bagher Ghalibaf, but he's still a regime creature who participated in nearly every state crackdown against dissidents and protesters since the revolution against the Shah in 1979. Even so, Western foreign policy makers have treated him as an objective moderate and reformer for more than four years now, and far too many journalists have likewise described him as such. Most reporters who aren't Middle East specialists have only a passing familiarity with Iranian politics on their best days, so let's look at what happened as if it took place in the West instead of a foreign land on the other side of the world. Western foreign policy makers have mistaken Iranian President Hassan Rouhani for a real reformer. Rouhani sounded like a genuine moderate, though, to anyone who took his campaign promises literally and seriously. He promised a human rights charter and better relations with the West. He'd fight government corruption and improve the economy. He won the middle class and the youth vote overwhelmingly, and you could be forgiven for thinking he's a genuine moderate or even a liberal if you knew nothing else about him. Iran still has no human rights charter. Nobody has more freedom in any real sense than they had when the bombastic Mahmoud Ahmadinejad had Rouhani's job. Government corruption is as epidemic as ever. The economy remains an emergency room case. Iran's relations with the West have been slightly less terrible since the Joint Comprehensive Plan of Action, commonly known as the nuclear deal, went into effect, but relations are deteriorating again thanks to Iran's continued support for militias and terrorist armies in Syria, Iraq, Lebanon and Yemen and the ramping up of its ballistic missile program, none of which Rouhani could stop even if he wanted to. 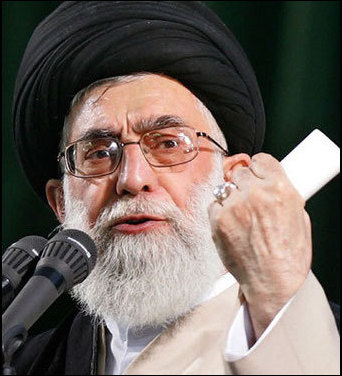 Supreme Leader Ali Khamenei is the one who calls every shot that matters in Iran. The thing about Rouhani is that, never mind what he actually thinks, he's not the head of state. Ali Khamenei is. He's the one who calls every shot that matters. 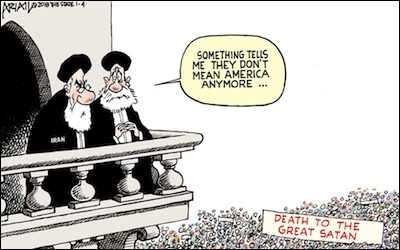 Rouhani can no more reform the Iranian regime than Washington, DC, Mayor Muriel Bowser can overhaul the federal government in the United States. The Iranian people understand this perfectly well even if distant foreign observers do not. Sure, Iranians chose him by a 3-1 margin in 2013, but only because he was the lesser of evils. Choosing between Rouhani and Ghalibaf was like being asked if you'd rather be shot or nuked. You're more likely to survive being shot in the abdomen than if you're vaporized instantly, but you're still gut-shot. The Iranian people chose to be gut-shot. Not that it makes much of a difference. They might as well have chosen to be nuked or cratered by a giant meteor since Rouhani's cabinet consists strictly of hardliners backed by Khamenei. He promised during his election campaign five years ago that Iran's opposition political prisoners would be released. Think about that for a moment. Let the contradiction sink in. What kind of countries have political prisoners? Only dictatorships. What kind of countries have meaningful campaign promises? Only democracies. A campaign promise in a dictatorship is worth somewhere between jack and squat, so of course Iran's political prisoners have not been released. Thousands more have been arrested during the last couple of weeks alone. And so much for Rouhani tamping down Iran's belligerent foreign policy. Last month, he spent an hour in parliament defending an increase in the Revolutionary Guard budget that makes it triple the size of the regular army's. The Revolutionary Guard exists for two reasons. First, to protect the government from the army and, second, to replicate itself, virus-like, in countries like Lebanon and Syria through its chief terrorist proxy Hezbollah. Disgruntled Iranians chanted all kinds of things in the streets before the demonstrations calmed down, among them, "Let Syria be, do something for me" and "Reformists, hard-liners, the whole game is over." The whole game alas is not over, but at the very least it's long past time for Western foreign policy makers to listen to the Iranian people and understand who and what Hassan Rouhani really is.